Yesterday we talked about avoiding being stupid. Let’s stick with this theme of avoidance. Today, let’s figure out better alternatives – and a way to avoid playing the blame game. Two great lines. One universal truth. Everybody blames somebody or something. Sometimes. I love Bleu’s music and find the lines rather brilliant, but I don’t agree with them. Not from a practical or helpful point of view anyway. Relying on an excuse is a very bad, destructive habit. And we don’t need excuses. We enjoy them though. We can even crave them. They make us feel better because it helps us with our delusion to think we’re not responsible. Or accountable. Culture and society train all of us to embrace being victims. Yes, I fully understand that bad things happen to people. Often beyond our control. But that’s not what I’m talking about. I’m talking about our sometimes (I hope it’s not frequent) reliance on excuses when we’d be better served to face the reality that it’s our own fault. Today’s message is short, simple, but powerful. 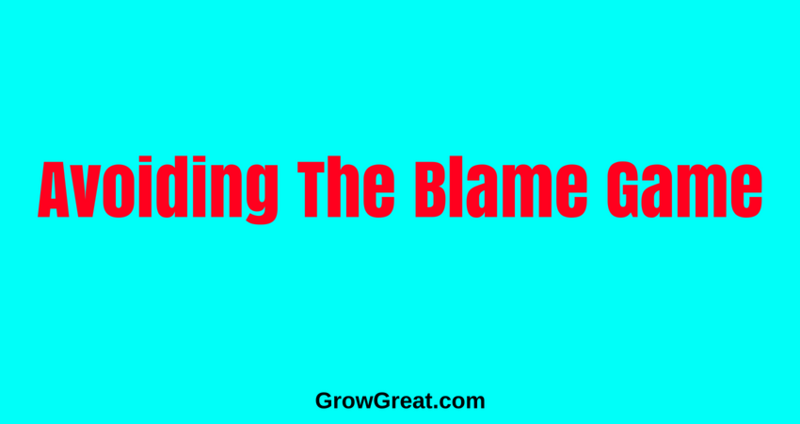 Avoid the blame game completely. Even if you really lean toward feeling like somebody or something did it to you. Try the rest of this week to develop the habit (that will hopefully live with you beyond this week) of accepting responsibility for everything that happens in your life. I should qualify that this is NOT about beating yourself up. Or complaining. It’s about building a bridge without excuses and getting over it. Moving past whatever hurdles you’ve got with a thought, and belief that you need to learn, make adjustments, and fix what ails you. Take control of your own life. That includes what you think, how you feel and how you choose to behave. It’s all on you. And only you. If that last marketing campaign didn’t work out as well as you’d hoped, quit trying to figure out who to blame. Step up, as the owner, and accept it yourself. That’ll protect your troops from becoming too bashful to try anything innovative. It’ll show everybody that you’ve got their backs, too. Besides, what difference does it make even if you were to assign blame? That’s a culture killer! That’s a much more productive game to play. Infinitely more fun, too.